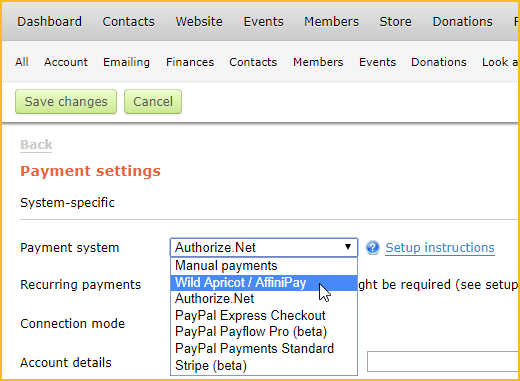 On the Payment settings screen, you indicate how your organization accepts payments. You can choose to accept online payments as well as manual payments, or just handle all payments manually. For instructions on setting up your site to accept payments from Wild Apricot Payments, our payment system powered by AffiniPay, click here. If you don't want to accept online payments, you can click the Payment system drop-down and select the Manual payments option. With manual payments selected, you can only manually record offline payments. You can choose the currency to be used on your site (and in your reports), and add payment instructions to be displayed to your visitors. You can choose a predefined currency or enter your own custom currency. If you enter your own custom currency, you must specify the currency name, code, and symbol. If you want to accept both manual payments and online payments, then follow the instructions below for selecting an online payment system. Manual payments can always be accepted regardless of your payment settings. If you want your site to accept online payments – including online credit card payments – you must first set up an account with a supported payment provider. Then, from the Payment settings screen, click the Payment system drop-down and select your online payment system. After you've selected your online payment system, you must enter your account details. Different information is required depending on your payment system. After entering the required account details, click Check integration to make sure your account details are valid. If you do not yet have an account with any of the supported payment systems, see Online payments for help selecting the best option for your organization. 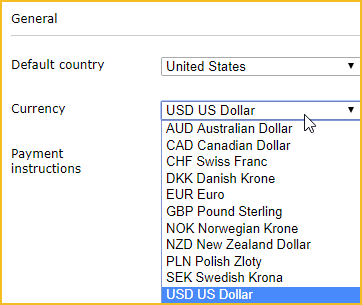 You must select the default country you want to display to customers, and the currency you want to use in your transactions (and in your reports). The currency you choose should match the currency used in your online payment system account. Towards the bottom of the Payment settings screen, you can enter payment instructions to be displayed to visitors to your site explaining how to use the online or offline payment methods. You can add different kinds of instructions to be displayed on different screens. Appears on Invoices and payments page in the member profile, on store invoices, and on manual invoices. ...and at the bottom of the invoice email sent to the registrant. You can override these instructions for specific events on the Registration types screen. Appears on the Review and confirm page of the membership application or renewal.